Winethropology: Roccafiore Fiorfiore, The Most Intriguing White Yet? 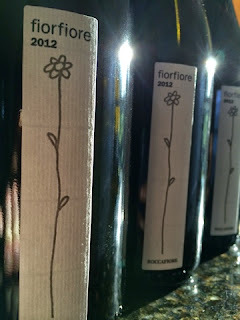 Roccafiore Fiorfiore, The Most Intriguing White Yet? Could this be the best white wine I've reviewed all year? Possibly. Most interesting? Intriguing? Swoon-inducing? Yes...yes, indeed. No, it's not a pricey Bordeaux Blanc or a Margaret River Chardonnay or even one of those mind-bendingly complex Portuguese whites made from grapes you've never heard of. It's Italian. The Umbrian countryside around Orvieto is a rolling patchwork of vineyards, olive groves, and hardscrabble brush growing from tufa outcroppings- a landscape that is echoed in the region's coarse, strong reds, but juxtaposed to its radiant, amiable whites. While Umbria enjoys a well-deserved reputation for full-throttle Sangratinos and Merlot-based monsters, this corner of the world also produces mesmerizing, complex whites which rarely hit the $20 mark here in the US making these wines a hot pocket of underrated value for the adventuresome consumer. 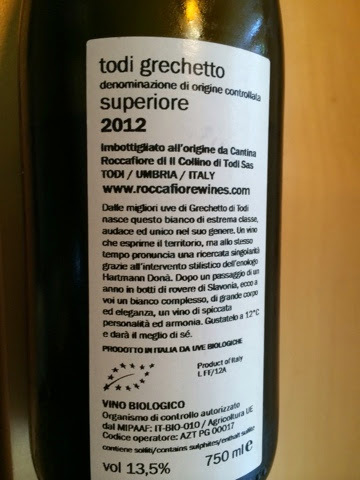 While "Grechetto" (greh-KEHT-oh) doesn't exactly roll off the American tongue like "Pinot Grigio", once you've experienced even an average example, you'll want it rolling on your tongue - with frequency. When made well, it's a wine with proud, sun-kissed fruit, and a not-so-subtle minerality that manages to weave itself delicately into a seamless bathwater texture. If you're looking for a comparable, more popular white, there isn't one. Grechetto is its own beautiful animal. Transportive. Subtly honeyed magic. Deep gold in the glass and delicate, racy aromatics. The palate is all intricacy and pleasure. In possession of all the classic characteristics from the region: proud fruit, minerality, and an alluring texture all delivered in a pure, polished, perfectly integrated wine. And, while the fruit is complex and prominent, it isn't the least bit cloying. But the texture - the texture - it's like a baby's smooth skin. Finishes long and beckons for an encore. Outstanding. To be sure, this is a bit of a wine geek's wine (and extra geek points for being a biodynamic wine), though its broader appeal is inescapable. Consumers biased towards domestic whites will barely recognize this as white wine at all - so different is this than what we are accustomed to - which only adds to its mystery and allure. Though this wine is absolutely worth the search, don't be afraid to look for wines at your favorite retailer labeled Grechetto or Orvietto Classico for a similar taste.